Italian Navy, in collaboration with the Ministry of Heritage and Culture and Tourism (MIBACT), has recovered a number of coins from the �treasure� of the wreck of the steamship �Polluce� that sank in 1841. 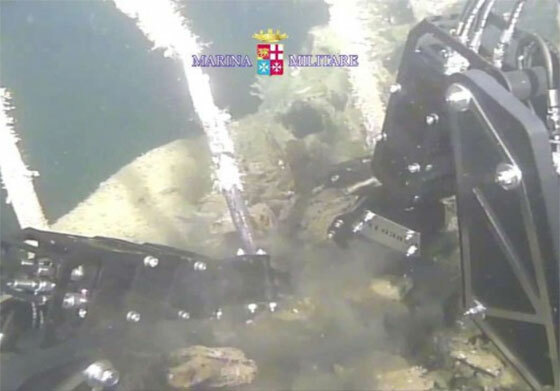 The recovery of the coins was conducted near the Italian Elba by a multipurpose ROV named Pegaso. The Pegaso ROV is capable of conducting Light Work, Visual and Instrumental inspection, Observation, Search and Survey tasks. The Polluce was approximately 50m in length and constructed of wood. On the 17 June 1841, whilst plying the route between Napoli and Marseille in the Piombino Channel, it collided with the Neapolitan steamer ‘Mongibello' and sank in a matter of minutes. Due to the rapid submersion of the ship, it sank with its manifest intact. This included gold, silver, jewels and cameos, diamonds, emeralds and all the goods that the rich passengers had brought with them. All of the 46 passengers survived the ordeal, except one crew member that perished in the incident.